Following a short AGM, the 2018-19 season concludes with a talk from our friends at Cromarty Courthouse Museum. The Courthouse Museum is an elegant Grade A listed building in the heart of Cromarty. Built in 1773 and restored as an award wining museum in 1990, it now houses fascinating permanent and temporary exhibitions and a comprehensive collection of objects and historical papers about the town of Cromarty and parish of Resolis. Paul Monk was Chair of Trustees of the Museum and curator for 10 years and has a vast knowledge of the Courthouse, the collection and the history of the building itself. Paul will give an insight into the history of the building from its inception until more recent times. Gordon Haynes is the current Chair of the Courthouse Museum Trust and will cover the last 30 years, since the building has been used as a museum. He will detail the Grade A listing and the requirement for the owners to undertake repairs and the Fabric Report of November 2017. This report showed the need for urgent repairs and their costs and will tell the story of how the trustees, volunteers, staff and helpers have all pulled together over the last two years to undertake maintenance work in the absence of anything forthcoming from the building owners, Highland Council. He will conclude with the latest situation and a call to arms! 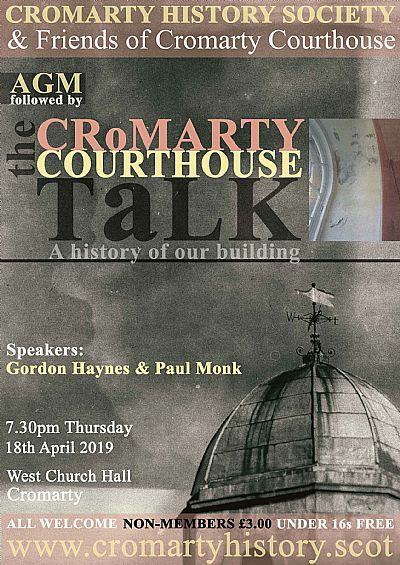 The Cromarty History Society has Special Summer fundraising event for the Courthouse Museum planned (more details to follow) and the new season resumes on Thursday 19th September 2019 . We look forward to seeing you then! 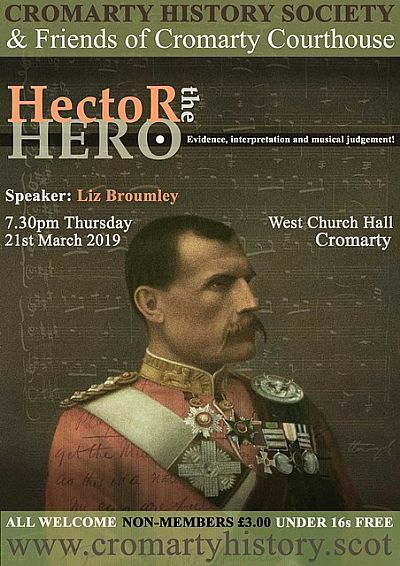 Meeting Thursday 21st March 2019: Hector the Hero — Evidence, interpretation and musical judgement! Hector Macdonald was born at Rootfield, on the Black Isle in March 1953, and died in Paris, in March 1903. Within days of his death James Scott Skinner composed the haunting melody ‘Hector the Hero’ as a coronach or lament in his honour, calling his death a ‘national calamity’. Macdonald had joined the ranks of the British Army (Gordon Highlanders) in 1870 and rose through the ranks to gain a commission (1880) through his skill and bravery in the 2nd Afghan War. He went on to take part in the 1st Boer War (1880/81), various Sudan Expeditions (1884/99) where he was credited with playing a major role in the success of the final battle at Omdurman. He took charge of the Highland Brigade during part of the 2nd Boer War (1899/1902). During his fighting career he was awarded 10 decorations, 14 clasps and was mentioned in 11 dispatches. He became an immensely popular and revered soldier across Britain but especially in Scotland and the Highlands. His posting to Ceylon in 1902 as Military Commander in Chief led to conflict with the local colonial society, who perhaps did not take too kindly to the son of a crofter taking such a privileged role in their society. Rumors about his sexuality surfaced and when these were published in the press Macdonald committed suicide. Many of his supporters at home disbelieved the rumours and were determined to honour the man they revered with monuments, poetry and music — all of which help to keep his name alive long after some of his detractors have been forgotten. Liz considers herself a fairly typical north west European mongrel, but one with enough Scottish ancestry for her to feel very comfortable living in the north of Scotland. Initially trained in the social sciences she worked in academia and industry in Scotland before an interest in computing seduced her into a major career shift. After dabbling in the dark arts of artificial intelligence she gained a doctorate in computer science. She spent the rest of her career as an academic, both tutoring and doing research. Her final role was to run a small research unit on e-learning within UHI, cleverly combining her social and computer sciences background with her love of the Scottish landscape. Since retiring she can often be found huffing and puffing her way up hillsides or tormenting a perfectly innocent fiddle, which is how she became acquainted with Hector Macdonald and James Scott Skinner. 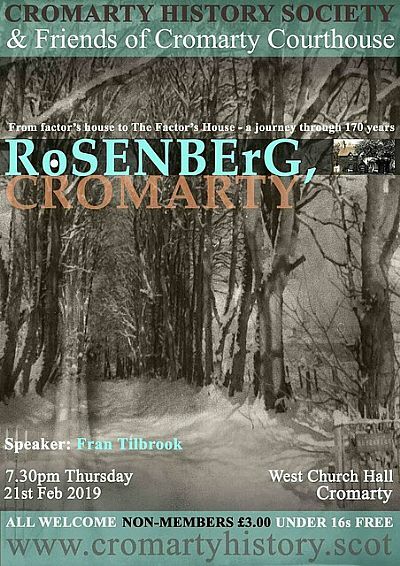 Cromarty History Society’s February talk is given by Fran Tilbrook who has lived in Cromarty since 1975 and for 39 years of that time in the house Rosenberg, the subject of her talk. “Rosenberg was built around 1847 as the Cromarty Estate factor’s house. Through its long life the house has seen a cast of interesting owners and occupiers come and go. Their fascinating stories will be revealed, some of which reach right down to recent and presentday residents of Cromarty. We meet a ruthless estate factor, the courageous widow of a war hero army doctor and her family, learn of a daring sea rescue with a romantic follow-up, get to know a human ‘Google’ and his film animator son, then an Antarctic scientist, and finally an award-winning B&B owner whose change of house name has returned Rosenberg to its roots. Along the way there are photos documenting the changing face of this well-loved family home”, Fran Tilbrook. An administrator for most of her working life, Fran’s last job was setting up and running the Health Promotion Department’s library of health-related resources for NHS Highland. She was Secretary of ‘Cromarty 2007’, the group behind the memorable ‘Sea Cromarty Sparkle’ events, and led the project Cromarty — Living by the Sea with its book and associated website. She writes occasional articles for Chatterbox and is part of the teams helping to keep the East Church clean and looking after the Hugh Miller Birthplace Garden (NTS). At our Christmas 2018 evening, one of our short talks was about the poet John Keats’ short time in Cromarty; here to catch a boat south, following his long walking tour through England, Ireland and Scotland. It was reassuring to note that the BBC didn't add much that we didn’t, and good to see that the Cromarty History Society is once again leading where others follow: we had Rosemarkie Man first and we had the “Who lived in THIS house” story before the BBC did their version.